If you love feta cheese like I love feta cheese – truly, madly, deeply, having once wondered if it could be made into a palatable ice cream flavor – this recipe is for you. Garlic, salty, cheesey goodness that is balanced by fresh vegetables for dipping. I am not exaggerating when I say that this dip had offers of dates and intimate bathing experiences when it was recently served. You’ve been warned. And you can thank me later. Chop feta into smallish crumbles. Blend with the rest of the ingredients. Serve with pita crackers, or cucumber, red pepper, zucchini crudites. It’s probably best served after chilling for an hour, allowing the flavors to blend. In a large skillet with cover, sauté the onion and garlic in olive oil and butter until golden. Stir in the next eight ingredients, tomatoes through black pepper. Simmer for five minutes. Add shrimp and wine. Continue simmering and stirring about three minutes or until shrimp is cooked through. Don’t overcook. Turn off heat. Sprinkle cheese over mixture. Cover with lid and let sit two minutes or until the cheese has slightly melted. Serve from the skillet with crusty French bread and a green salad. Note: to make the recipe more like Bonefish’s, use crushed tomatoes instead of chopped and add some cream to make a thicker sauce. This recipe has become our Friday night tradition. It’s wonderful served with a Greek salad, some sautéed spinach, and good bread. Mix the juice and zest of the lemon with twice as much olive oil. Add the vinegar, garlic, Greek seasoning, and garlic salt. Place the chicken thighs in a large baking dish and scatter the quartered potatoes in between the chicken. Pour the lemon and olive oil mixture over the chicken and potatoes. Top it with another dusting of Greek seasoning or garlic salt, if you want. Bake at 375 for 45 minutes. 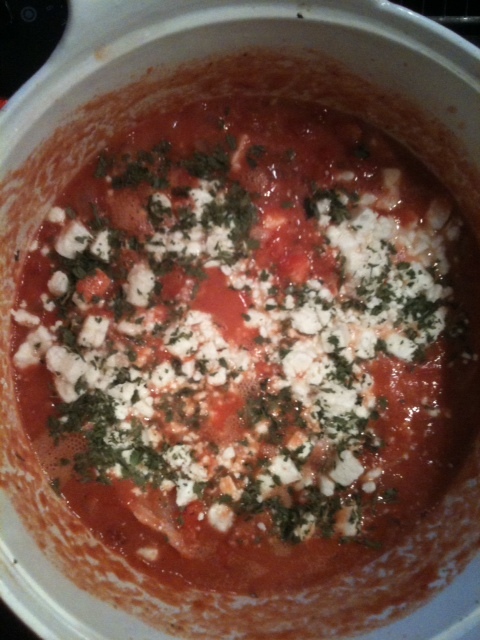 Sprinkle some feta cheese on top and broil briefly, just until the cheese starts to melt. Slice the potatoes into 1/4-inch slices. Layer them in the bottom of a casserole or deep-dish pie plate. Overlapping is fine. Drizzle a little olive oil on the potatoes and cook at 350 for about 10 minutes. While the potatoes are cooking a little, whisk together the eggs, milk, and mayonnaise. Separately, chop up the feta cheese. Remove the potatoes from the oven and sprinkle them with a generous sprinkling of Penzeys Greek Seasoning. Pour the egg mixture over the potatoes, sprinkle the feta cheese evenly into the egg and bake in a water bath (I used a baking dish for the water) at 350 for about 45 minutes. Drain the pasta and use the same pot to heat oil and cook garlic until the garlic is softened. Add a can of diced tomatoes, basil and lemon zest and cook a few minutes longer, stirring often. Add the pasta back in. Stir in some fresh spinach (I used almost a full bag, but I really like spinach). Stir until warmed through. Salt and pepper to taste. Serve on plates with feta cheese sprinkled on top.